PUZZLING COLLAPSE OF THE THERMOSPHERE: Researchers are puzzling over a sharper-than-expected collapse of Earth's upper atmosphere during the deep solar minimum of 2008-09. "Something is going on that we do not understand," says John Emmert of the Naval Research Lab, lead author of a paper announcing the finding. Get the full story from Science@NASA. 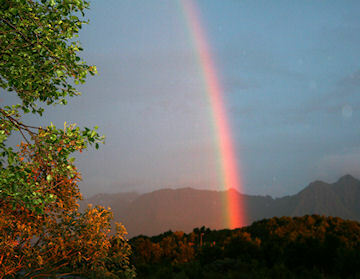 "This bright and beautiful rainbow appeared last night around 00:15 am," says photographer Therese van Nieuwenhoven of Laukvik, Norway. "It was caused by the midnight sun shining into a rain shower." Normally, midnight is the time for the aurora borealis, but with the Arctic summer sun on one side of the sky and rainbows on the other, Northern Lights don't stand a chance. This is how it will be until the sun sets in August. Next week, on July 22nd, a solar wind stream is due to hit Earth and possibly spark a geomagnetic storm. Arctic sky watchers should be alert for auroras ... somewhere over the rainbow. 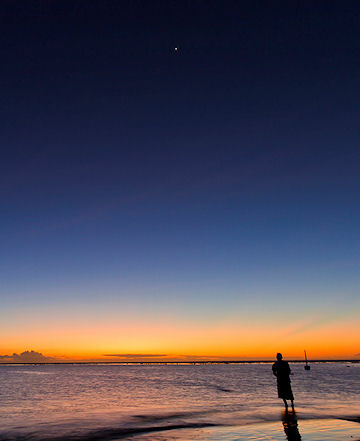 VENUS AT VENUS POINT: On July 11th, Canadian astronomer Alan Dyer was in Tahiti to witness a total eclipse of the sun. If only that cloud hadn't moved in at precisely the moment of totality...! He didn't leave the South Pacific empty-handed, however. "On the evening of the eclipse," he says, "I was able to photograph Venus from Venus Point." "Venus Point is where Capt. James Cook made his famous observations of the transit of Venus in 1769, so it is a historic spot for astronomy," explains Dyer. "This vertical shot shows all four evening planets, Mercury, Venus, Mars and Saturn; together they define the plane of the solar system, which in the tropics rises almost perpendicular from the horizon. It was a beautiful scene." Apparently, missing an eclipse isn't so bad ... when you miss it in the South Pacific. Browse the gallery for more views. On July 17, 2010 there were 1138 potentially hazardous asteroids.